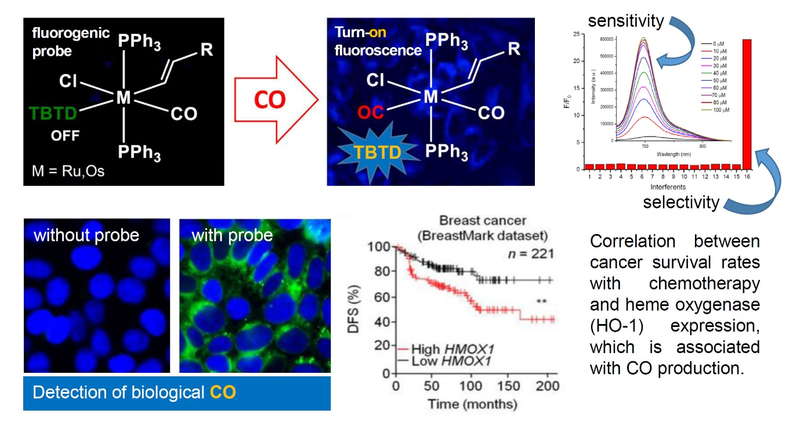 This project aims to develop a new family of water-compatible probes that are able to fluorogenically detect the small amounts of carbon monoxide (CO) produced endogenously in cells and in the body. This production is largely due to the catabolism of haem by haem oxygenase (HO-1) and the inhibition of this enzyme is associated with better chemotherapy outcomes in humans. These probes will be used to interrogate the effect of CO in suppressing the immune response towards tumours, allowing the visualisation of this small molecule in vitro and in vivo. Translation of this approach into the clinic could allow the estimation of CO production as a function of HO-1 expression to be used to gauge the likely response of patients towards chemotherapy as part of an assisted immune response. Cancer immunotherapy harnesses the immune system to attack and eradicate cancer. For this to be achieved, the mechanisms which are exploited within the tumour microenvironment to suppress immune responses need to be investigated and optical methods (e.g., fluorescence imaging) are well-suited to study this. Tumoural immune suppression is a major hurdle to permitting effective cancer immunotherapy in the clinic (Arnold, Ng et al, Nature Comm. 2018, 9, 1). The enzyme haem oxygenase-1 (HO-1), which is expressed in a variety of tumours, generates carbon monoxide (CO) in its enzymatic degradation of the molecule haem. Alongside many other regulatory cellular roles as a gasotransmitter, CO is immune suppressive and can compromise T-cell responses in the tumour microenvironment, preventing cytolytic killing of the tumour. However, the detection and real-time tracking of CO in cells and in vivo requires probes that are synthetically-straightforward, robust, non-cytotoxic as well as being highly sensitive and selective for CO. The Wilton-Ely (JWE) group has developed a series of probes based on ruthenium and osmium for the selective detection of CO in air (J. Am. Chem. Soc. 2014, 136, 11930) and in cells (J. Am. Chem. Soc. 2017, 139, 18484). The detection system is based on the extremely high affinity of carbon monoxide ligand for the metal centre, leading to rapid and selective binding and very low detection limits (1 ppb). These complexes show excellent stability and are not cytoxic. This has been illustrated in the monitoring of in vivo production of endogenous CO in response to inflammation in a realistic (subcutaneous air pouch) mouse model (J. Am. Chem. Soc. 2017, 139, 18484). However, new probe designs are needed, which have improved solubility and emission properties and can target particular features in the cells (e.g., mitochondria), associated with CO generation. The PhD project will involve ligand synthesis, coordination chemistry, tissue culture, fluorescence measurements in cells and translation to animal models (with Dr James Arnold, Tumour Immunology Group, KCL).